"Fact and fiction are so skilfully interwoven that there's no doubt John CLIVE is now the new master of intrigue, power and mystery. 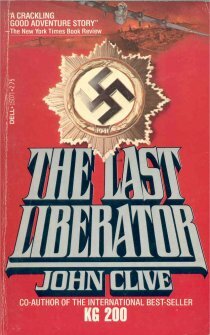 "Its a taut tale ard Mr Clive handles the materials very well... A cracking good adventure story written with real flair..."
"Its called The Last Liberator and its involved John Clive in a mysterious, almost macabre search among the lost men and lost planes of the Second World War. Its a story of the frantic, sombre days at the end of the war - but reaching forward into modern times...a captured American Liberator when it crashed was carrying documents of vital importance to various people alive today.."
Douglas Orgill, THE DAILY EXPRESS.
" John Clive's well organized, nicely paced thriller builds background nicely, intoduces believable characters and moves each seperately to a dramatic climax..Clive hides nothing and the reader picks up information with a sense of participation. There are flying and diving thrills; chills and an atmosphere of evil and terror. Clive mixes fact and fiction cleverly in a tightly constructed story which is just the right length." " This is a grim, taut tale that will hold you to the last page." "This is a great novel to watch with your mind's eye. The writing in it is so good it never intrudes on the imagination as it springs the show to its bittersweet end."